Forging (Hada) : Fine steel gives off darkish impression. Forging is conspicuous Itame grain mark in general, Mokume burl and some flowing Itame ware partially appears here and there. Surface is covered in reflecting Ji-nie glitter of hard metal granules over the surface where thick and darkish Nie lines of Chikei appears. Temper line (Hamon) : Hamon is based on Ko-nie-deki which is a bit on stronger side hard metal granule Nie-based, starts with short slope of Yakidashi then forms round-head Gunome mixing with tall pointed head Togari-ha. The interior is covered with mist-like crystallize area Nioi where is activated with thick lines of Ashi toward the cutting edge. Temper of tip (Boshi) : Temper of the tip forms Gunome just below Yokote, wide straight Suguha then medium circle turns back. Tang (Nakago) : Nakago is a bit on shorter side to the length of cutting edge, UBU in original of a distinguishing trait of Fish belly (Tanago-bara) shape. Good taste of patina. Katte-sagari slanting left file marks. The back ridge is flat. Single-bevelled (Ha-agari-Kurijiri) heel in full. One retaining hole of Mekugiana. 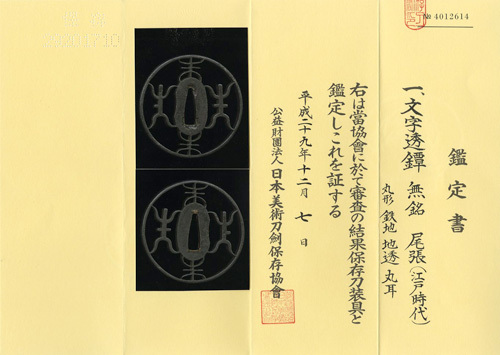 The signature in front is a bit on smaller side, deeply chiselled, seven long character that starts with an official district title Suruga-no-kami 駿河守, the name of clan Fujiwara 藤原 and smith name MORIMIACHI 盛道. The first generation MORIMICHI 盛道 with Suruga-no-kami 駿河守 title was born during early Eiroku era (ca.1558) in Gifu, Mino province as a son of smith MORIMICHI 盛道 who belonged to MUROYA 室屋 branch of Seki-Shichi-Nagare group 関七流. He is reportedly a relative smith of Mutsu-no-kami DAIDO 陸奥守大道, initial name was KANEMICHI 兼道, who was the founder of Mishina school during Bunrokuk era (1592-95) with his four sons Iganokami KINMICHI 伊賀守金道, Rai KINMICHI 来金道, Tanbanokami YOSHIMICHI 丹波守吉道 and Echunokami MASATOSHI 越中守正俊. MORIMICHI 盛道 reportedly went up to Kyoto in his early age then he moved from Gifu to Nagoya on after Nagoya castle relocation in Keicho 15 (1610). Changing over from the Middle Ages of Muromachi to the Modern Times of Edo period while dramatic turning period of politics, economy, culture and ideology, style of Samurai fashion was innovative changed, those sword smiths who were active in Mino province had played the major roles to meet with luxurious oriented demand from powerful Samurais. Fish belly shape of Nakago was popular, frequently seen in Ise-Senko 伊勢千子、Owari MORIMICHI 尾張盛道, Suruga-Shimada 駿河島田、Soushu-Tsunahiro 相州綱広 and Bushu-Shitahara 武州下原 schools to understand that frequent cultural exchange had become very active along Tōkaido (region). 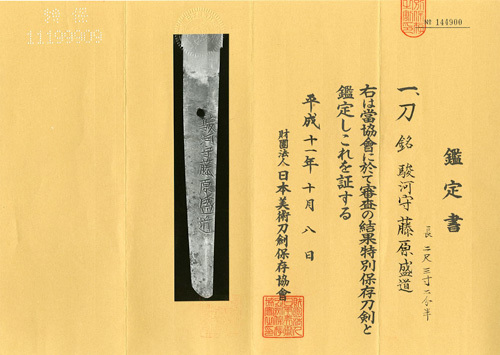 The subject Katana is identified as a work of the 2nd generation MORIMICHI 盛道 who was active during Kanbun era (1661-). The entire shape creates a majestic manner by powerful Owari Samurais. The elaborate made filemarks and powerful chisels of inscription in Nakago shows excellent taste of patina to remain an excellent condition over almost 350 yeas history. This katana has been treasured over decades of generations and presenting the typical workmanship of MORIMICHI 盛道. Fuchi : Ribs of folding fan design, Shakudo copper alloy ground, Nanako-ji surface, Gold Iroe, unsigned, Kashira made of Tsunoguchi. Menuki : A spider and Cobwebs design, Shakudo copper apply Yobori carving. Tsuka : White layskin, black silk cord Tsumami-maki style lozenge warp. Preserved in Shirasaya plain wood mounting, Single layer silver foiled Habaki collar.